Finding retail space in Manhattan is all about location. Once you find the perfect location, square footage is almost always sacrificed. 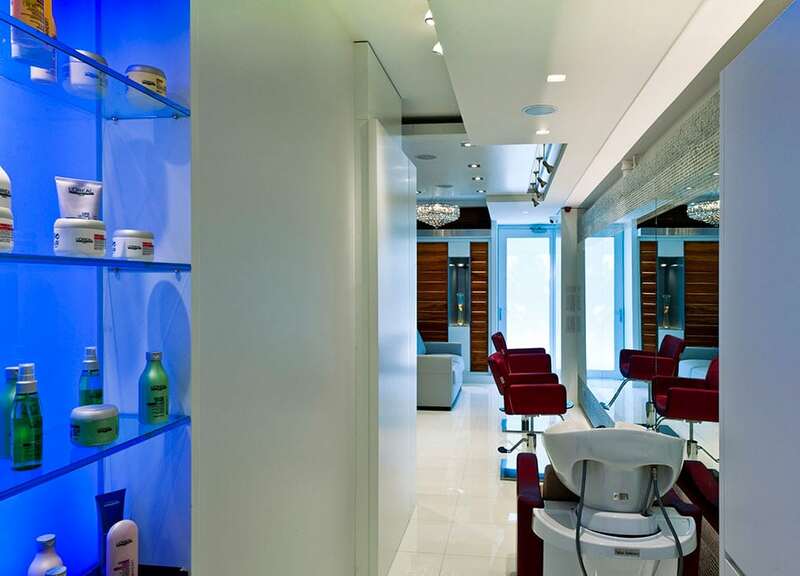 This holds true when looking at this 325 square foot luxury salon in Tribeca. 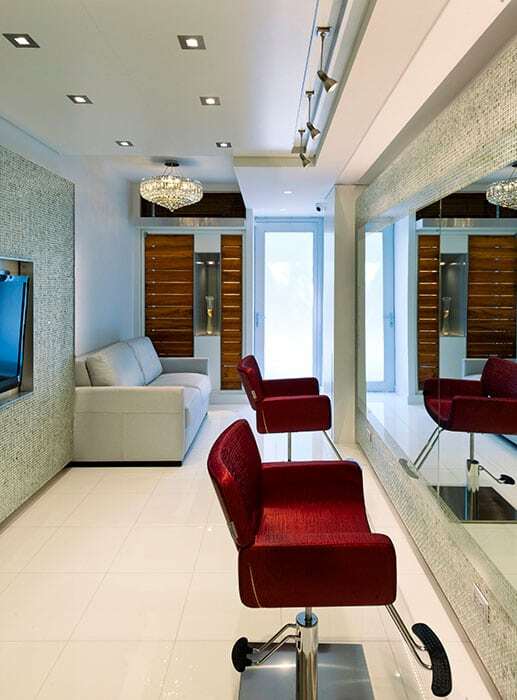 The client wanted her high-end and extremely exclusive salon to reflect her taste and finesse in styling talents in a glamorous atmosphere. 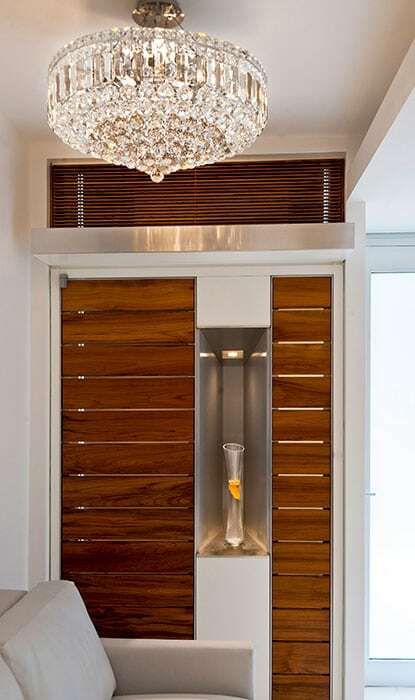 This goal was achieved by using pragmatic spatial design with contemporary and luxurious materials. A major challenge was to overcome the limitations of this narrow space. 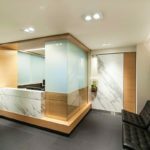 To achieve an open and spacious design, we opted to not have cabinetry pieces or storage that’s typically seen at each salon station. 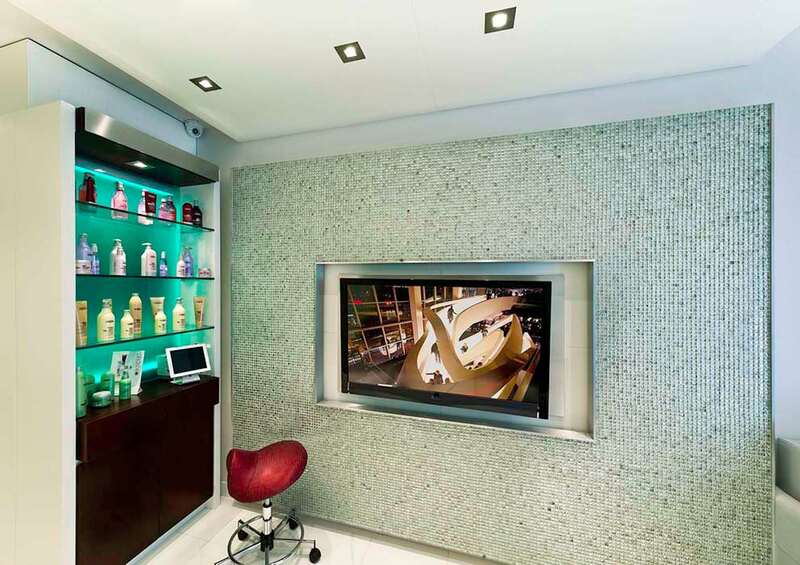 The hierarchy of the sleek mirror wall attracts the viewer, and rolling storage for hair supplies is taken out as needed. The backdrop is a palette of whites and pale greens with a pop of color in the fabric chairs, custom wood, and a color changing LED dimmer light behind an etched glass panel. 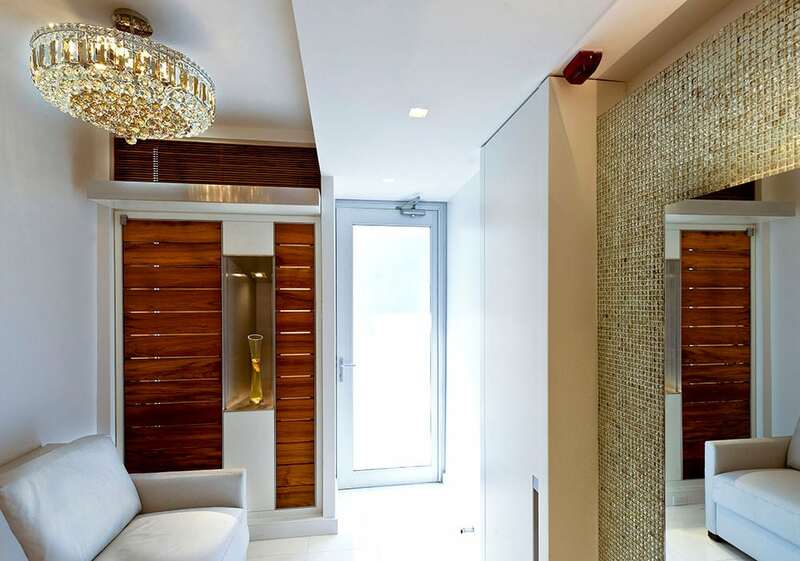 The tiled walls were custom designed glass and metallic square Cancos tiles. The large mirror and using a light color palette on the floor, walls, and ceiling all contribute to visually opening the existing narrow railroad layout. This 18 foot mirror has clear glass along the top and bottom, and projects from the wall giving the illusion that it is floating. The lighting had a simple concept, one gorgeous dramatic focal fixture and the rest to be small with a subtle recognition. The chandelier is a crystal empire series LED. 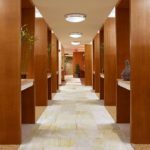 Small square down-lights with satin nickel trim are symmetrically organized in the main salon space. 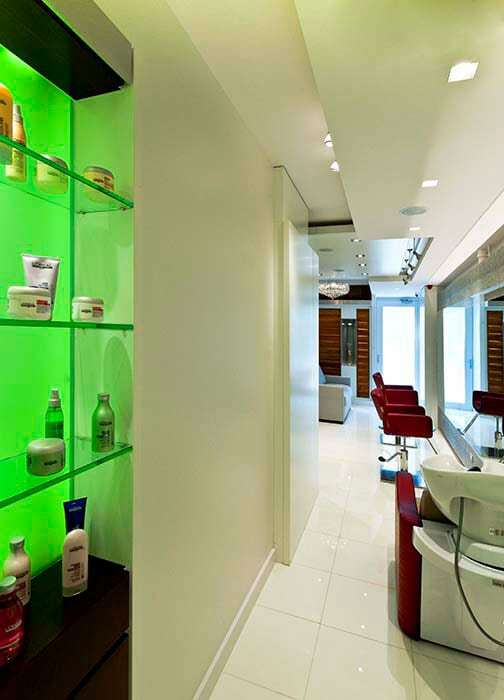 Directional LED fixtures, in a recess cut out of the ceiling, highlight the mirror. The transformations that take place during any renovation is always so rewarding for both the client and architect. 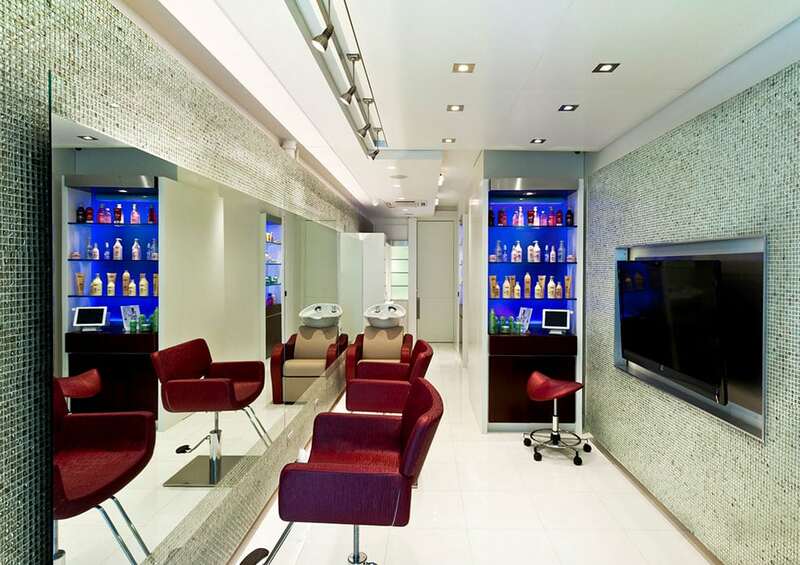 The architecture and interior design has now given this elite salon a luxurious experience the client desired.